The world’s population will surge to nearly 10 billion people by 2050 and will consume two trillion calories daily. To meet that need, the global agriculture industry must lift food production by 70%. But with more frequent extreme weather events and urbanisation encroaching on farmland, there are real challenges ahead. Yet technology could deliver much needed solutions to this global issue as innovations in smart technology shake up agriculture. The agriculture technology industry, or ag-tech, will play a crucial role in meeting the growing global demand for food, addressing critical challenges such as declining arable land and salinity, access to water, and pest and disease issues. StartupAUS forecast the global ag-tech opportunity will be worth US$189 billion (A$239B) in just four years. That means there’s plenty of opportunity for innovative ag-tech juniors to deliver meaningful solutions to this global issue. One whip-smart small cap that looks to be making a real difference is Roots Agricultural Technologies (ASX:ROO). ROO is developing and seeking to commercialise technologies to solve major problems in modern agriculture, including water shortages, food production security, extreme weather conditions and global warming. Its two patent-protected technologies, Root Zone Temperature Optimisation (RZTO) and Irrigation by Condensation (IBC), can deliver greater production and cost savings to farmers, while improving output and access top alternative water irrigation. ROO’s ability to provide sustainable, affordable solutions to real-world problems clearly differentiates the Israeli-born company from the rest of the ag-tech crowd. After a flourishing 2018, ROO has kicked off the new year in style, scoring further commercial sales and installation deals with Dagan Agricultural Automation, its exclusive distribution partner in China and one of the world’s leading ag-tech integrators. And the deals haven't let up. Today, ROO announced that it has secured a second sale of its Root Zone Temperature Optimisation (RZTO) heating and cooling system in America. The sale is to independent cannabis grower Mendocino Natural Farms in Northern California. Mendicino is a cannabis producer, processor and wholesaler that holds three cultivation licenses and is a member of the Emerald Triangle Collective – a collective run by farmers for farmers. The sale is Roots’ second sale in North America within a month and sees it stamp its authority in the cannabis-related ag-tech space in this region. Smashing a circle of milestones and fast-tracking commercialisation of its razor-sharp tech, this rapidly maturing $7.5 million-capped junior’s hard work in 2018 is paying off, with 2019 looking to be another powerhouse year. 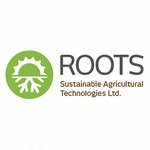 We last caught up with Roots Sustainable Agricultural Technologies (ASX:ROO), in December with the article ‘Ag-tech Innovator Roots Ramps Up Cutting-Edge Root Zone Cooling Technology Commercialisation'. The article came at the end of a fruitful year that saw ROO demonstrate the effectiveness and versatility of its RZTO heating and cooling system on a variety of crops and in various growing conditions through a series of pilots and proofs-of-concept. The company expanded and now has commercial operations across Australia, Israel, China, US, Spain and South Korea, and has plans for further expansion. 2018 was also the year in which ROO took its RZTO technology to the multi-billion-dollar cannabis market — a market that’s experiencing sharp growth as legislation becomes more hospitable globally. For those of you just tuning in to the ROO story now, check out our previous updates for a more in-depth understanding of how the technology works. The short video below of ROO co-founders Dr Sharon Devir and Boaz Wachtel discussing the company’s two key technologies, RZTO and IBC, is helpful too. 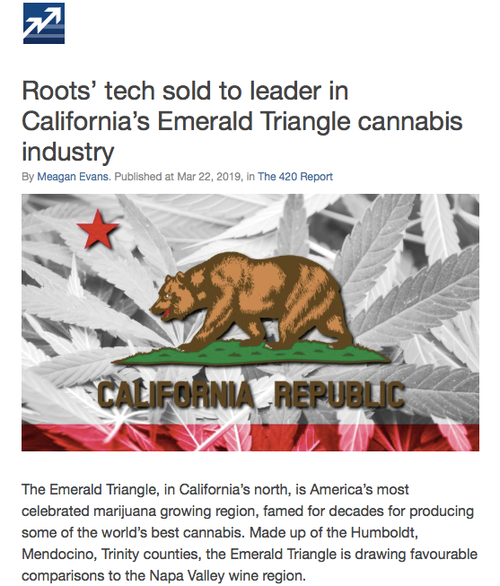 Roots offers investors a good mix of state-of-the-art technology, that translates into higher margins for customers, not to mention the stability and diversification of ROO’s multiple revenue streams from mainstream agriculture and the rapidly expanding pot industry. As stated, today ROO secured a second sale of its Root Zone Temperature Optimisation (RZTO) heating and cooling system in America to independent cannabis producer Mendocino Natural Farms in Northern California. The US$30,000 (A$42,300) sale involves Roots installing its proprietary RZTO cooling and heating technology in a 10,000 square foot hoop house at Mendocino Natural Farms’ property in Round Valley, California. RZTO will be installed in two stages, with the first stage dedicated to the installation of a heat pump for root zone heating. During the second stage, coils will be inserted at depth for root zone cooling using the principles of Ground Source Heat Exchange (GSHE). This is the second sale in North America in less than a month and the company looks to be gathering some serious momentum here. The first sale was to cannabis industry leader Tim Blake and was the result of Roots’ Technology Showcase in North America in February and a successful open field RZTO heating pilot cannabis in Washington State during challenging autumn growing conditions of heavy frosts and temperatures below zero degrees. 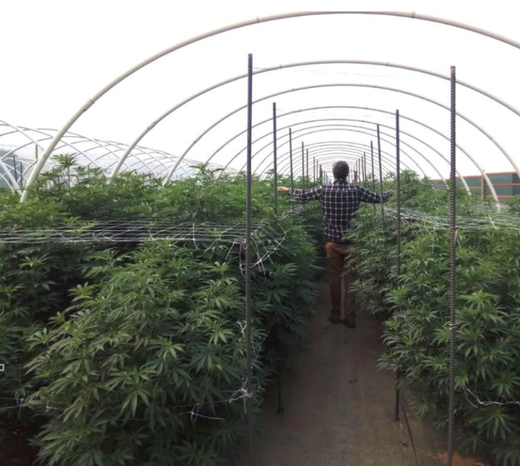 The world first open field pilot in Washington State in heavy frost conditions during October and November last year, saw Roots’ patented RZTO technology used to heat the roots of multiple cannabis strains. The RZTO heating system was used on eight cannabis strains in collaboration with American Farms Consulting and its clientele of licensed cannabis producers. Results showed a 60% to 283% increase in average cannabis dried un-trimmed bud weight, while the heated plants also increased the average dried weight of cannabis leaves. This increased yield can generate substantial additional revenues for cannabis producers. Sales in North America come as operators are increasingly looking to adopt environmentally-friendly technologies that support healthy plant growth without the use of harmful chemicals, which is hugely important particularly with the burgeoning cannabis industry. 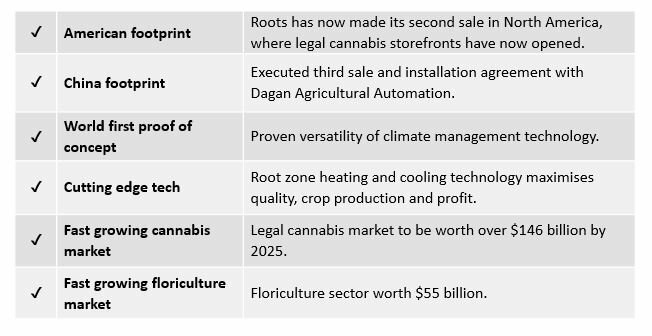 Roots recently executed its third sale and installation agreement, worth $64,000 for a state-of-the-art greenhouse project with Dagan Agricultural Automation, its exclusive distribution partner in China. The sale involves the installation of Roots’ proprietary Root Zone Temperature Optimisation (RZTO) technology in two-thirds of a one-hectare greenhouse in the Guiyang district of Guizhou. This sale to Dagan follows substantial orders of $323,000 and $278,000 respectively and also forms part of Dagan’s distribution agreement with Roots, with exclusivity conditional on US$19 million in sales over a five-year period. While China is a behemoth in terms of agricultural production, accounting for 53% of global vegetable production, it faces multiple challenges. 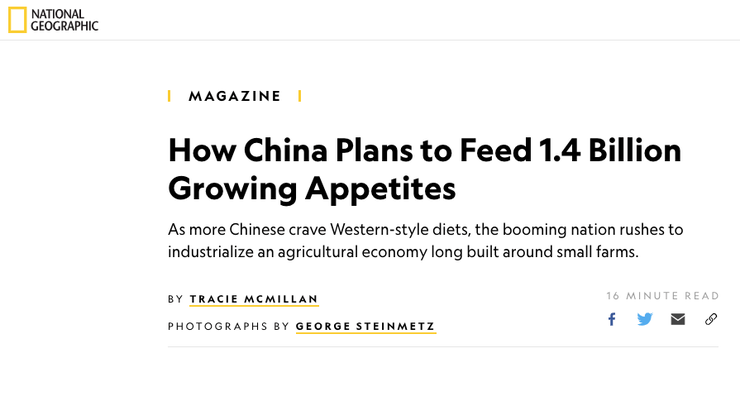 China has to feed nearly three times the number of people per unit of land as the rest of the world and its newly wealthy middle-class demand for more protein-rich diets. Yet constraints of local land and water resources that make the required production increases a challenge. China has to feed nearly three times the number of people per unit of land as the rest of the world. This is where technologies, such as RZTO come into play with its impressive crop yield improvements of up to +272% that ROO has achieved. Drawing on the success of RZTO on a range of crops, edible herbs and medicinal cannabis, ROO is now seeking to demonstrate how the technology can optimise the root zone temperatures of flowers. It is off to a good start, following a report from a commercial farm that was using the technology on Alstroemeria, a lily native to South America. The commercial farm reported that the technology had extended flower production by eight weeks, despite inhospitable air temperatures, while growth and cultivation of flowers with cooled roots started seven weeks earlier. This allowed the farmer to dramatically increase growth and gain higher yield quantities. In turn, the productive growth period is extended beyond the standard growing season, resulting in premium prices — in this case, of more than twice the standard rate — and for longer periods. 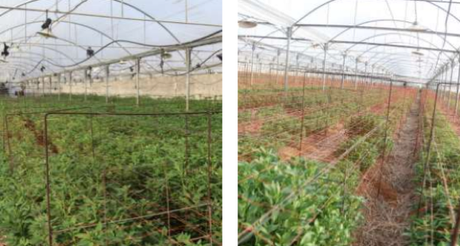 The test was conducted on the cool climate crop during the Israeli summer between September and October 2018 in a quarter of an acre greenhouse. The site in central Israel holds an average of 33,000 rhizomes per hectare, each producing about 40 flowers per year. The RZTO cooling system kept the flower roots relatively stable within an optimal range, despite high ambient air temperatures in the greenhouse. At 45 days growth, the RZTO-cooled Peruvian lilies (shown on the left in the image below) were full of buds and already flowering. Due to high greenhouse temperatures, farmers in Israel previously had to limit harvesting to only 25 weeks a year. However, the early blooming shown with RZTO added into the mix increased production by 20% – the equivalent of 150,000 flowers per hectare. The ability to harvest flowers year-round will double the farmer’s yield and an investment in the technology could pay for itself in just one year. 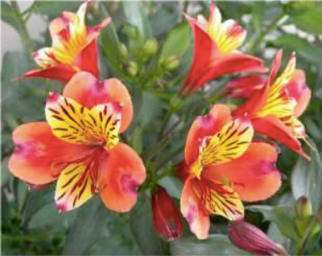 Alstroemeria is just a small slice of the growing floriculture industry, that’s worth around US$55 billion annually. Yet most cut flowers do no travel well and have limited lifespan, so crop yield optimisation and growing cycle management is critical, meaning there are multiple opportunities for ROO within the floriculture space. The successful Alstroemeria pilot has opened up in-depth discussions for ROO with stakeholders in the floriculture sector, who are keen to see whether RZTO could benefit crops grown under extreme conditions. A couple of weeks before its success with flowers, ROO also demonstrated the efficacy of its RZTO technology in increasing the size of cannabis crops in open fields. As we noted earlier, interim results show that using the RZTO system on cannabis crops in an open field resulted in anywhere from a 40% to 272% increase in average plant weight compared to unheated crops. RZTO was used in various RZTO heating treatment architectures (total of 216 plants) and corresponding control groups (total of 81 un-heated plants). Cannabis roots were heated to stabilise root temperatures at optimal degrees, despite air temperatures dropping below freezing. This proof-of-concept was conducted in collaboration with American Farms Consulting and its clientele of licensed cannabis producers. These interim results well and truly exceeded ROO’s expectations, especially given that they were achieved in a heavily frosted open field. This suggests that ROO’s RZTO technology is the only way for growers to mitigate the risks of high-value crops in open fields, where plants are exposed to extreme external weather conditions. In addition to increasing plant wet weight, and corresponding net weight, by stabilising root temperatures, ROO expects final results for the proof-of-concept to show faster growth rates. This will enable growers to benefit from higher, premium prices for longer periods. Based on the local Washington state US$0.30 price per gram, the yield increase equates to an additional income of US$60,000 to US$405,000 per acre, for 40% to 270% yield increase, respectively. In most strains, wet weight is directly correlated to the size of the plant and the eventual yield per plant. Using these performance figures, farmers can expect in most treatments and breeds to get a return on their investment within a year. Medical and recreational cannabis sectors will be worth a combined US$146.4 billion market by 2025. These markets are increasingly competitive, with growers looking to new, clean technologies to increase profitability and extend growing cycles. Consequently, demand for ROO’s tech could be increasingly driven by clients who don’t see RZTO as just an optional extra, but rather that it’s a must-have to be economically viable. 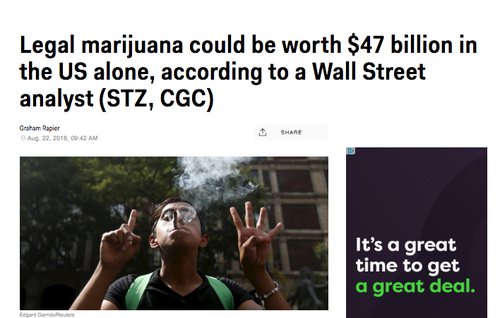 As those titles suggest, US marijuana sales are quickly catching up to those of beer and wine, and legal sales alone could be worth US$47 billion within a decade, according to RBC Capital Markets. In this rapidly developing pot market, moreover, many crops are now being grown in open fields due to lower initial capital expenditure — which gives ROO and its smart tech a significant leg up. We’ve been tracking ROO’s movements for quite some time — from not long after its 2017 ASX debut, to its first revenue-generating deal, and beyond, and it became clear early on that this ag-tech junior is an emerging industry leader. Given ROO’s finely honed tech assets and the progress it’s made in commercialising them globally, it could well be that ROO is undervalued by the market and an excellent entry point into the fast-growing ag-tech space.